Wow. Issue 200 sure came around quick. It doesn’t seem that long ago that it was miles away, but here it is with an official Skin Deep on sale date of 29th June in the stores. Those of you with eagle-eyes will however notice it's on sale from today from the Jazz store if you want it early. I’ve been driving this car now (officially known as “market leading title” to keep the guys upstairs happy) for the fastest ten months of my life. As is always the case when a ‘new guy’ takes over any magazine, I wanted to make some changes to give it a little bit of a different feel to what we had before and with issue 200, all of this will come to fruition. The results of this, you’ll be able to see and judge for yourselves. There’s been a lot of talk over the last year and I’ve been doing some listening... some of it is rather ‘selective listening’ but hey... I’m a bloke. Let me break it down, I looked at the market (including the battle for visibility on the newsagents shelves), looked at what we were doing, looked at what everybody else was doing and thought we could bring a better magazine than we have been to the party. As much as I would like to, I couldn’t throw everything in my head at one single issue, so let’s say that issue 200 is a “beginning”. First up, we have a new sub-editor on board. Those little mistakes that creep into the magazine annoy me as much as they do you. To deliver professional and educated messages - even when you’re having some fun with an article - is important. We’ve cleaned up a lot over the last year but little errors still kept sneaking in there - such is the hazard of working on a four weekly cycle. This is a step in the right direction to eradicating them. As an editor, you’ve also got to look at whether the reader is getting value for money. 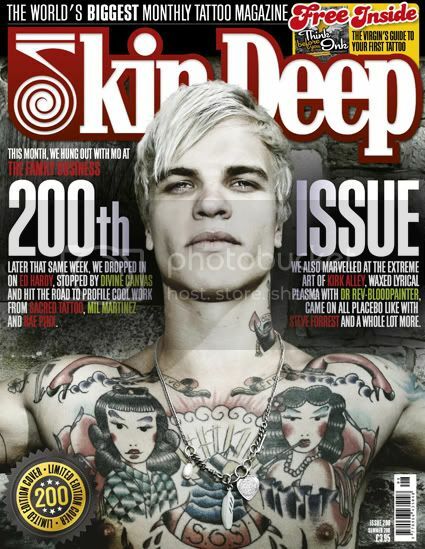 Using magical powers, we’ve now changed the size of Skin Deep to match that of Jazz Publishing’s Tattoo Master title. For those of you that have never seen that publication, it’s wider than a ‘normal magazine’ and a great format for utilising picture space inside. For issue 200, I also wanted to make a bit of a statement, so we’ve increased the page count making this issue the “World’s Biggest Monthly Tattoo Magazine” and I’m not sure how we’ve done this (not my department) but we’ve kept the price the same as it has been for years. There’s little point in giving with one hand and taking away with the other. Once you get your sticky paws on the mag, the first thing you’ll notice is that Skin Deep has undergone a total redesign. We basically stripped it down to its core components and then rebuilt it - right down to updating the logo and masthead. Poor logo. She has served the magazine well but was starting to look just a little bit tired for the times we live in. Finally, we’re having a celebratory 200th birthday party on Saturday 6th August at Tattoo Jam. Come! It will be a total blast!